Cafe culture meets comic book geekery in Geek Retreat, the new Glasgow hang out for those who like their coffee served with a side of superheroes, which opens tomorrow, on Free Comic Book Day (4th May). Geek Retreat is a brand new café and comic book store in the heart of the city, proving a hang out space for fans of superheroes, graphic novels and cult TV series to meet, chat, shop and geek out. The café will serve everything from Matthew Algie coffee and paninis, to hot dogs, milkshakes, superhero cupcakes and for the more adventurous, ‘Fluffernutter’ toasties and Pop Tart ice cream sandwiches. Those eating in the café will be able to play a range of cult board games including Star Wars 3D chess, Marvel Monopoly and Simpsons Scrabble. Meanwhile, the shop will offer a wide range of graphic novels and comics, figurines and memorabilia (including Iron Man 3 and Game of Thrones merchandise, to coincide with the new movie launch and series). Geek Retreat will even stock locally-made jewellery by Rachel Leitch, themed around cult hits such as Batman, Doctor Who and Transformers. The store aims to have something for people of all ages. The store and café is opening on the most important day in the comic book world's calendar, Saturday May 4th, Global Free Comic Book Day. From 9.00am, comic book fans can drop in and pick up a free comic and check out what Geek Retreat has to offer. After years of enjoying his own den at home filled with comics and games, owner Stephen Walsh felt it was time to bring the geeks in the city out of hiding and provide a real-life social space for a generation less enamoured by pubs and fast food joints. Geek Retreat aims to be both a place for established fans to develop their love for comics and all things geek, but also a welcoming and unintimidating place for those that want to learn more. Whether you just want to read your comic among like-minded people or take your time looking through the toys, graphic novels, figures, games and geeky apparel for sale, friendly staff are hand to advise, 8.00am till 8.00pm on weekdays, 9.00 till 7.00pm Saturdays and 10.00 till 7.00pm Sundays. If an item is not in stock, staff will be happy to order it in or source it for you. Geek Retreat intends to offer a place for local talent, giving shop space to Scottish writers and artists and linking up for events. 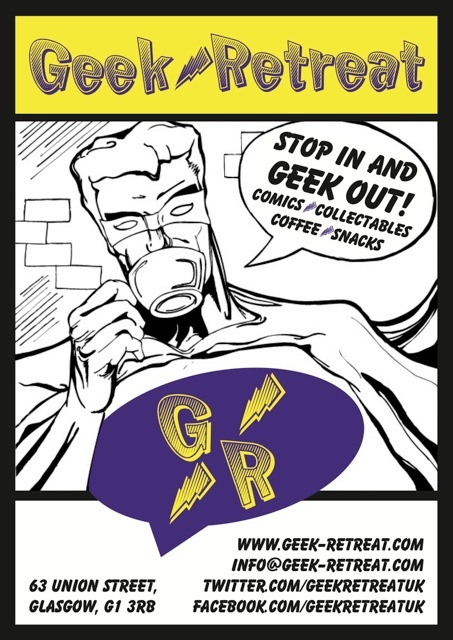 Beyond the cafe itself, Geek Retreat will develop an online community via its website, forum and online store.